A few months ago I asked some of my subscribers to take a survey on what they would like to see more of on the website and any new features they would be interested in seeing. Among some other great ideas, something that came up was starting a running podcast. As someone who does not quite like the sound of their own recorded voice (I am sure many of you have the same issue), I was not quite sure the podcasting would be the thing for me. What this idea did, however, was to get me thinking about what would be involved in a podcast and what benefits their might be to me and my potential listeners. While I have, in the past, created and edited podcasts for work, I had never considered what might be involved with creating one focused on my passion. How much time would be involved? What would I talk about? Whom would I interview or ask to join me for guest discussions? Most of all, who would actually want to listen? I decided the best way to approach the issue was to be part of a podcast myself to see how it felt from the guest side. As luck would have it, I was recently approached by Kari Gormely who runs a website and podcast called The Running Lifestyle. Kari was kind enough to feature me as her runner of the week, where we discussed running, parenting, and blogging. It was a great experience, and I encourage you to give it a listen and consider subscribing to the podcast. I also had the opportunity to talk with Chris Evans on his This Is Your Captain Speaking podcast, where, among other topics, we talked in-depth about the importance of being positive role models for your kids through fitness (and exposing them to great shows like Power Rangers, Duck Tales, and Danger Mouse). You have to love talking. If you do not have the love for the art of talking, you probably do not want to start a podcast. The whole idea behind the podcast, is of course, talking. Kari shared with me that she loves “talking to people and understanding why they run and what they get out of it.” Whether it be via phone, Google Hangout, Skype, or old-fashioned in person meeting, if you are not a good conversationalist than creating a podcast is not for you. You have to have time. Podcasting takes time. Scheduling guests. Recording. Editing. Promoting. There is a lot involved in running a successful podcast. Denny Krane of The Diz Runs With Podcast shared that “for each episode of approximately an hour in length, it takes 2-3 hours of additional time to put everything together.” Just like most things in life, to make it count you have to put in the time. You have to have a plan. No one likes to listen to someone ramble on incoherently for an hour. If your podcast is not well thought out, it will show. Having a successful podcast means having a game plan, from general topics to specific questions. You have to be able to guide the conversation from point A to point B and bring it back on track if it gets lost along the way. You have to let your passion shine. In a recent article on Men’s Health, I stressed the importance of letting your passion shine. 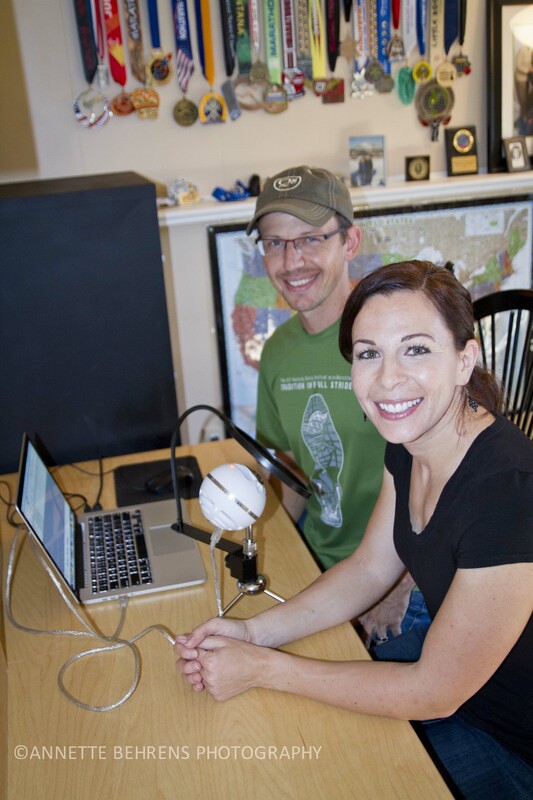 If you are going to start a podcast, make it something you are passionate about…like running! If you let your passion shine through, it will grab your audience’s attention and have them coming back for more. People like to be inspired, and nothing inspires more than passion. All in all I think podcasting is an incredible medium to reach runners (and people in general) on, and I encourage you all to consider subscribing to the podcasts linked to from this post (and maybe think about starting one of your own!). As for starting a podcast myself, the jury is still out. Time is not always on my side, but the idea will linger in my mind, right along side the dreams of becoming an ultra marathoner. Do you have a favorite podcast that you listen to? Share it in the comments below! It was a pleasure talking with you and thank you for including me in your blog. What makes podcasts great is when people are raw and themselves. It’s not about being perfect, but connecting with your guests and audience. We talked about editing your interview, but I didn’t because it perfectly showed how passionate you are about running. You’re a Rock Star Matt (in addition to being a Rock ‘n Blogger) and I think you would make a great podcaster! Thanks for having me on Kari, it was a great experience! Hello! I am not sure if we have formally met, but I have been following your blog for a while now. I just wanted to say that I think you are doing a wonderful job with your blog, and a podcast would be a great idea. You have the perfect opportunity to try it out by working with Kari. I am actually the podcaster for the Runners Connect podcast, and although I had never done anything like it before, I am absolutely loving it, and have met some incredible people who I would never in my wildest dreams have met had I not been a podcast host. I think you will do a great job, and I would recommend listening to the podcast answer man, social media marketing, and john lee dumas pocasts for learning more about it 🙂 Good luck! Thanks for the compliment, and thanks for the recommendations! I would like to echo was Tina Muir said. There are great podcasts out there to learn from. I also like Ask Pat (Pat Flynn). Thanks Kari, and yes! It is such a wonderful thing to be able to do! Meet so many wonderful people! I will check yours out also! I do love Pat Flynn too! Thanks for the shoutout! I wish my podcasting studio looked as cool as the photo at the top. (Maybe some day). We are getting by on a Blue Snowball mic and audacity. Pretty cool how inexpensive it is to start a podcast!